The history of Persian Rugs (Persian Carpet) -a culmination of artistic magnificence- dates back to 2,500 years ago. From being simple articles of need, floor and entrance coverings to protect the nomadic tribesmen from the cold and damp, the increasing beauty of the Persian carpets found them new owners - kings and noblemen, who looked upon them as signs of wealth, prestige and distinction. While these are the most common layouts variations and adaptations do occur. For instance there is the repeat medallion, similar to the medallion but rather than a single central medallion it includes either a column or grid of medallions. In Persian the design is known as Boteh Jegheh and it has been used in Iran since the Sassanid Dynasty (AD 224 to AD 651). Some design scholars also call the distinctive shape Boteh and believe it is the convergence of a stylized floral spray and a cypress tree: a Zoroastrian symbol of life and eternity. A floral motif called Buteh, which originated in the Sassanid Dynasty (200–650 AD) and later in the Safavid Dynasty of Persia (from 1501 to 1736), was a major textile pattern in Iran during the Qajar Dynasty and Pahlavi Dynasty. In these periods, the pattern was used to decorate royal regalia, crowns, and court garments, as well as textiles used by the general population. According to Azerbaijani historians, the design comes from ancient times of Zoroastrianism as an expression of essence of that religion and it became subsequently a decor element which is widely used in Azerbaijani & Isfahan culture and architecture. Boteh is the Farsi word used to describe in immature flower or palm leaf. This motif is often found in a cluster (all-over pattern) however has been known to be used in isolation in intricate, artistic weaves. Various interpretations of the design have included: Flames, Tear drops, Pine cones, Pears and Trees In the 19th century in Scotland, the design which was then found on Kashmir shawls and scarfs was copied to make the now world famous Paisley shawls. The Gul motif is often seen in Turkman, Gorgan and Khal Mohammadi rugs. 'Gul' is Farsi for flower and is normally used to describe these octagonal, all over or repeated patterns. The Herati motif is a very common repeated field design which normally consists of a flower centred within a diamond surrounded by curved leaves parallel to each side of the diamond. This can be in various forms in either geometric or curvilinear designs. Mina-Khani is used to describe this distinctive pattern used in many Persian rugs. The pattern is made up of repeated daisies interlinked by diamond (often curved) or circular lines. 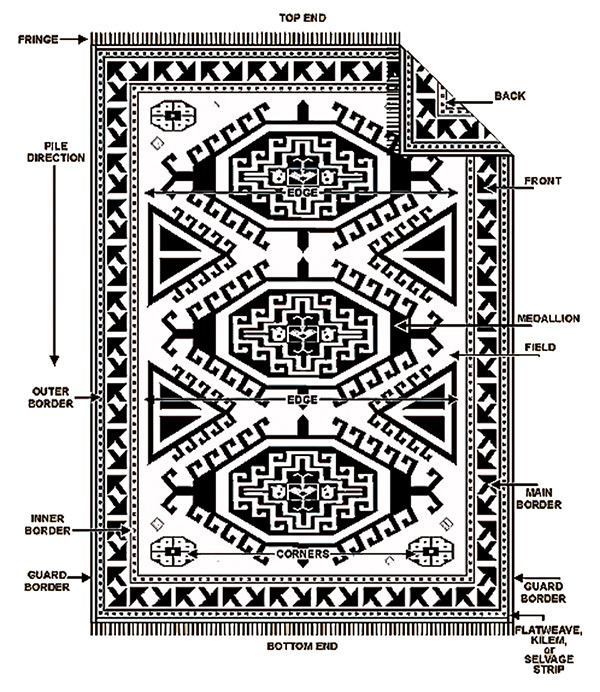 This design is used regularly in a number of different rug types and is not representative on one single area. The design is almost always an all-over patter, it can be found in many rugs but certain workshops almost exclusively use it such as those weaving Varamin rugs. The mina khani design is a repeating field pattern not uncommon to find in a wide variety of oriental rugs. The isolated design (seen left) generally features a mainpalmette surrounded by a circular vine, and eight alternating-colored stylized flowers. While the isolated repeating pattern is square, the overall impression appeals to what would be classified as a "lattice" design. Flowers used often resemble a top view of a pomegranite. The Rosette design is a circular arrangement of motifs radiating out from the centre medallion suggesting the petals of a rose. This can be used in the borders however is mostly limited to the field and can be in either naturalistic or geometric form. The Rosette design is often found in Nain rugs. This is the name given to a group of palmettes which can be found in all-over and medallion designs as well as in borders. 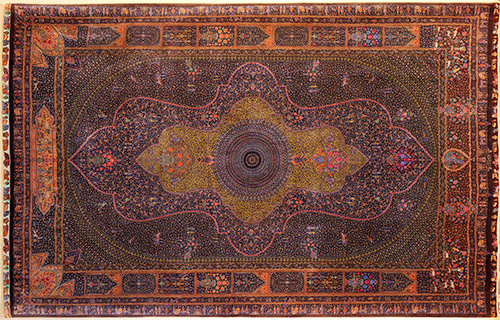 Shah Abassi motifs are frequently seen in Kashan, Isfahan, Mashad and Nain rugs amongst others. But is perhaps most common in Tabriz rugs. As with the tree patterns, the animals depicted in these carpets are lifelike. Sub-patterns include: Tree Hunting Ground, Panel Hunting Ground and Allover Hunting Ground. The original patterns represents the place in a mosque where the prayer leader stands and is ornamented with pillars, chandeliers and flowers. Among the sub-patterns are: Tree Mehrab, Vase-Column Mehrab, Chandelier Mehrab, Vase Mehrab and Landscape Mehrab. These patterns have lines and geometrical shapes such as polygons, in contrast to the majority of Persian designs which have lines moving in curves and circles. 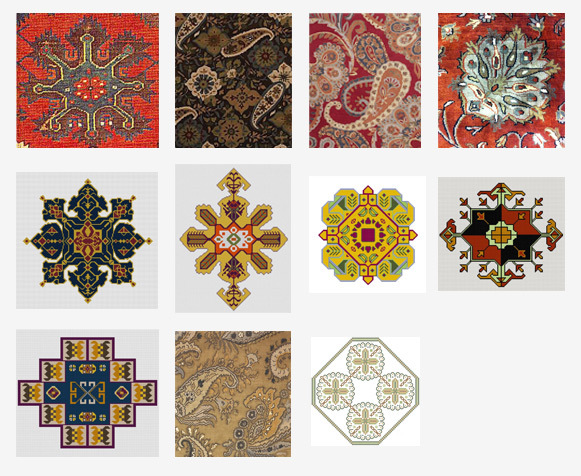 Sub-patterns include: Geometrical Connected Panel, Geometrical Medallion, Striped Geometrical, Geometrical Scarf Medallion, Plain Ground Geometrical, Khatai Geometrical, Star or Mosaic Geometrical, Shiraz Khatam Geometrical, and Josheghan Geometrical. The oldest and most original of Persian carpet-patterns, these elegantly simple creations of the tribal creativity were inspired by their natural surroundings. Transferred by nomadic tribesmen from one region to another all over Iran, most of the patterns are named after the places they were first woven or the influential individuals who ordered the weaving done. The oldest and most famous sub-patterns in the group are: Heibatloo (associated with Abadeh and Fars Province), Ghashghai Paisley, Afshari, Khatouni, Ardebil, Mazlaghan, Khamseh, Saveh, Tafresh, Heris, Mehraban, Goravan, Zanjan, Meshkin, Bakhtiari, Sari, Koravi, Yalmaz, Gonabad, Sistan, Ferdows, Salarkhani, Yaghub Khani, Sangchubi, Ali Mirzai, Janbeggy, Prayer Rug, Javin, Musaabad, Veece, Gharachch, Senneh, Floral Bouquet and Baluchestan. The exquisite handwoven carpet is more than 360 years old and measures 8ft 9ins by 6ft 5ins. It sold for $33,765,000, or about $601,380.34 per square foot. 'I thought it might sell for 10 or 15 million dollars,' Mary Jo Otsea, the auctioneer and senior consultant for rugs and carpets at Sotheby’s, told The Washington Post. 'No one ever expected to see it on the market. Its beauty and rarity — the closest comparables are in museums.' The intricately woven rug of red, blue and green colors was owned by an American billionaire industrialist who bought it in the early 1900s, and the artifact was donated to a museum after his death in 1925. 'The Clark Sickle-Leaf Carpet is without question one of the most iconic and important carpets ever to appear at auction. 'It was made during the Safavid dynasty in Persia in the 1650s and made by several weavers at a very sophisticated workshop in south east Persia. 'It would have been for a noble person as it would have been very expensive to make. 'William Clark, a billionaire industrialist who also became a senator, purchased it from a dealer in Paris while on a tour of Europe in the early 1900s. 'He must have hung it because it is in very good condition and is unlikely to have spent much time on the floor. 'He bequeathed his collection of carpets to the Corcoran Gallery of Art in 1925 and it is being sold by them for future acquisitions. The rug has a wool pile and the foundation is made of cotton and silk. 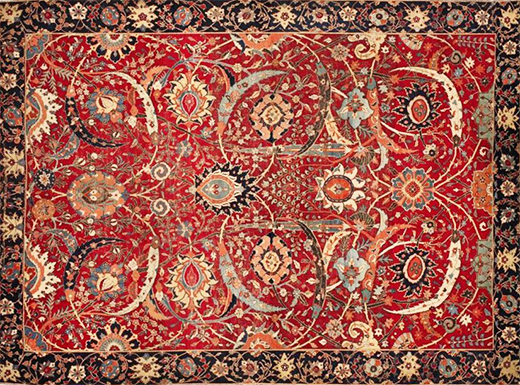 A Kirman (Kerman) 'Vase Carpet' featured in Sotheby's sale 7845 lot 100 from Southeast Persia: A Mid-17th century in the size of 11'1" x 5' at a record sale price and per square foot basis ($173,232.97 USD per square foot) and a record price of $9.599 Million! This carpet has an interesting history which the original dealer put a value of only 900 Euro. Dating from the 17th century, the rug may look unremarkable to an untrained eye. It measures 3.39 by 1.53 metres and is adorned with a motif of leaves and flowers. Made by weavers in the Kirman region of Persia, the carpet once belonged to 19th century society host the Countess Martine Marie-Pol of Béhague, who boasted a large collection of Iranian art. The countess left the rug to her nephew the Marquis of Garney, and it stayed in the family until 1987 when a German dealer bought it in an auction. Like the Augsburg dealer, he did not realize the piece’s true value and gave it to his housekeeper as a gift. The rug is called Persepolis and it has 180 raj or 4265 KPSI. It took 3 master weaver more than 14 yrs and 2 month to weave this unique and one od kind rug in the holly city of Qum. This one of kind master piece rug is pure silk and no other rug exist in the world with such quality. The Persepolis Rug has more 40,400,000 knot in it and the master weaver had to wear special glass to weave this one of a kind rug. This master piece has more than 350 Colors and they have used traditional pattern of ancient IRAN (PERSEPOLIS-https://en.wikipedia.org/wiki/Persepolis) and Appadana Palace(https://en.wikipedia.org/wiki/Apadana) to weave this master piece. In 1996 the Iran Carpet Co. received a contract at the order of the Diwan of the Royal Court of Sultanate of Oman to cover the entire floor of the main praying hall of the Sultan Qaboos Grand Mosque in Muscat in the Sultanate of Oman. This order was unprecedented. The contract called for the carpet to be the Largest Hand Made Carpet in the history of the world. Not just the largest but more than four times larger then the previous world's largest carpet. The carpet was also to be an artistic marvel.